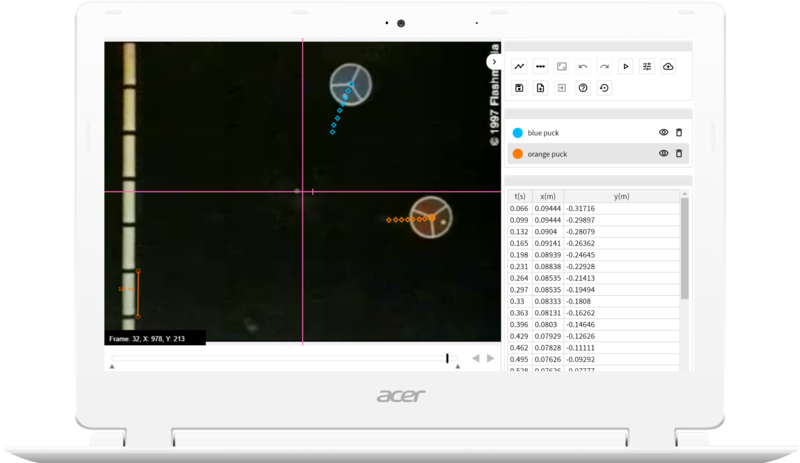 jsTrack is an online webapp for plotting the motion of objects in videos, an analog to Tracker. Being entirely browser-based, jsTrack is even compatible with Chromebooks. Best of all, it's open source! Data tracks are used to differentiate between the motion of different objects. jsTrack allows you to create as many as you like. jsTrack also allows you to add a scale to track data in real-world units, and there is a positionable axes which points are tracked relative to. jsTrack allows you to easily save your project and then continue editing it later. You can save it as a file to your computer or to Google Drive. Data is visible to you right as you track points, and you can easily export data in many formats to allow you to edit in programs like Excel or Sheets. The entire application source is available to everyone for free. There is absolutely no server-side code or configuration, the only change you would need to make is to change the API keys to use with Google Drive.